The Manfrotto 161MK2B Super Professional Tripod Mk2 is one of the tallest in the Manfrotto line of tripods, and is capable of supporting cameras up to 44 lb, at a height of 105.1". 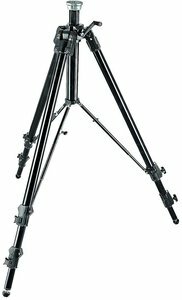 It is the ideal large format tripod for home and studio use. The 161MK2's center column is geared for easy, accurate adjustment. 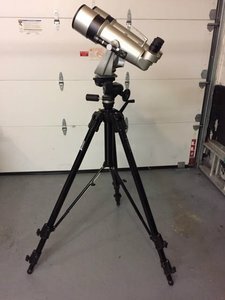 This tripod can easily handle an 8x10 view camera even at full height and precarious angles. The built-in mid-level spreader adds anti-torsional rigidity and stops the tripod legs from accidentally being knocked wider apart. Compared to a ground-level spreader or dolly, the mid-level spreader has the advantage that it stays well out of the mud and dirt and is more suitable for use on uneven terrain. The geared center column allows for safe and precise height adjustments. The three set screws in the camera platform can be used to permanently secure the head to the tripod, providing additional security. The twist locks are slightly slower to use than the more common "Quick Action" flip lever leg locks, but give total control over locking force. In addition, they are much easier to service out in the field. 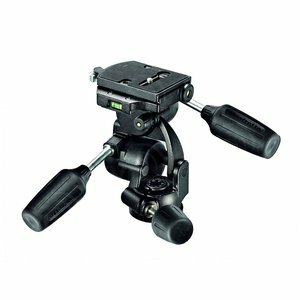 The 808RC4 head streamlines the range of 3-way heads by incorporating new elements while maintaining all the excellent Manfrotto features. There are two balance springs in the vertical tilt (forward/backward) and horizontal tilt (left/right) movements. These springs enable you to more comfortably handle heavier camera loads (such as very long lenses) with minimal effort. Both springs can be turned off in case normal head operation is required. The head is comprised of aluminium and designed in a manner to support up to 8kg yet lightweight and small enough to pack in any camera kit. The standard quick release system is used to accommodate larger camera platforms which incorporates dual axis bubble levels to achieve level shots.